An Australian expat says he wants to conquer all roads that link the north to the south of Vietnam with his bicycle. The Australian expat often rides during his two years of living and working in Ho Chi Minh City. Sometimes he even cycles to go to work. 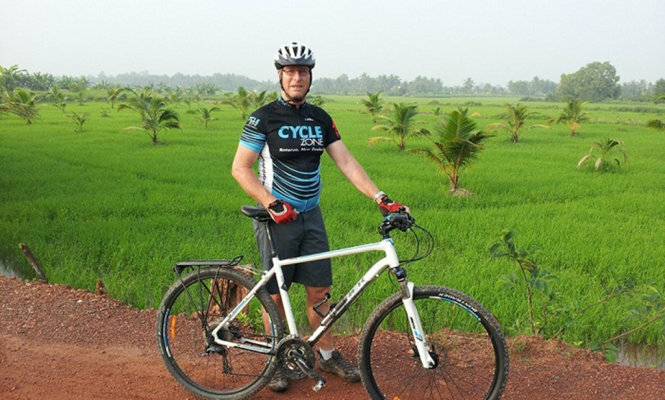 Waller said he was first impressed by the beautiful landscapes and roads he saw on a trip to Nha Trang, a resort city in the south-central region, which led him to follow his passion for cycling. He encouraged his friends who also like cycling to establish a group called Saigon Sunday Riders. Now, this number has increased to nearly 20 people. As the leader, Waller is in charge of drawing up riding schedules, training all teammates, and advising them on dietary habits. They gather on the weekend and start cycling from Ho Chi Minh City’s District 7, where they live, to some rural districts like Ben Luc in neighboring Long An Province and Long Thanh in Dong Nai Province. Long-distance cycling requires Waller to prepare a detailed plan at the beginning of the week and then inform the other members so they can arrange their own schedules. Saigon Sunday Riders’ longest journey was from Ho Chi Minh City to Da Lat in the Central Highlands province of Lam Dong, which ended in Mui Ne, during five days. During the trip, they went sightseeing, visited a textile factory, enjoyed civet cat coffee, talked to locals, and discovered new landscapes. Waller is also responsible for looking for accommodations and food, saying he always does some research and books hotel rooms one week ahead to assure his team members could have a good place to rest. Contestants are required to ride over a distance of 75 kilometers, including dangerous mountainous passes.